With snowboarding and skydiving among his favourite pastimes, 32-year-old Adrian Macfarlane knew there was a risk his sporting exploits could one day lead to a nasty injury. What the civil servant did not expect, however, was to end up in hospital after a curling accident. 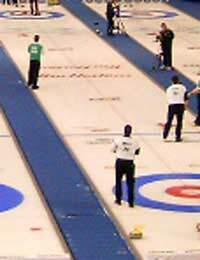 To the casual observer, curling is, for the most part, a relatively tranquil sport played at a fairly sedate pace. Despite this, there are plenty of dangers. It is played on ice, so there is always the risk of a fall, and the curling stones are made of pure granite and can weigh up to 44 pounds. It can take new curlers time to find their feet while moving or standing on the ice and beginners can fall on occasion, but most can get around without too much difficulty after a few games. Adrian has plenty of experience on the ice, however, having taken up the sport as a teenager. Adrian was talking to a member of the opposing rink at the tee line and was just sidestepping a stone when he lost his footing and fell, cracking his head against one of the granite stones in the house.